The dollar is so strong these days, especially against the euro, that it is spurring many Americans to chase their dreams of visiting the Eiffel Tower in Paris, riding a gondola through the canals of Venice or hiking the majestic Bavarian Alps. It makes a lot of sense. 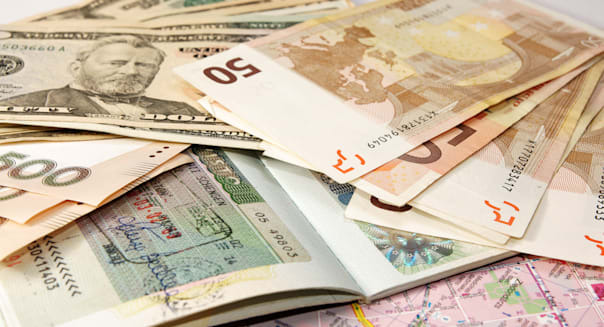 By traveling when the dollar is strong, you can save yourself a small fortune. That helps bring down the cost of foreign travel to a level that seems manageable to many Americans who might have previously felt those sorts of trips were beyond their reach. Some unscrupulous merchants abroad might try to take advantage of the dollar's strength -- and your enthusiasm -- to fill their own pockets a bit more with a sneaky tactic called "dynamic currency conversion." However, if you keep alert and know what to look and listen for, you can head these bad guys off at the pass before they're able to rip you off. Here's the situation: Say you're at a shop near the Eiffel Tower in Paris. You've just spent a day taking in all the sights in one of the world's most spectacular cities, and now you're buying a bottle of wine and some bread and some cheese so you can have a picnic in the park and relax as the world passes by. You even splurge a little bit on the bottle because the dollar is strong and because, well, it's Paris. "Bonjour, madame," the man behind the counter says. Then, in broken English as he holds your credit card, he says, "Would you like for your transaction to be done with dollars or with euros?" You pause. "Oh, I didn't realize I had a choice. But I guess since the dollar is so strong, I'll go ahead and pay in dollars." And you've just fallen into the trap. It's called dynamic currency conversion, and paying in dollars instead of the foreign currency is pretty much never a good idea, even though it sounds like one. Your credit card issuer offers a better exchange rate than a merchant ever could. In this situation, the merchant -- not the credit card company -- is doing the currency conversion. That's a problem. Credit card exchange rates are pretty hard to beat. That small Parisian merchant wouldn't be able to match that. The currency exchange booth at the airport won't be able to either. The merchant will likely tack on a bunch of fees. If you just let your credit card issuer do the currency conversion, there's a good chance you won't pay any extra fees for the service. That's because most credit cards have eliminated foreign transaction fees. Those fees used to add 1 to 3 percent on top of your bill when you purchased something overseas, but not anymore. In recent years, those foreign transaction fees have become far less common. Let the merchant do the conversion, and it's a different story. The fee a merchant will charge you for this service can reportedly run as high as 7 percent of the transaction. So make sure the card you travel abroad with doesn't charge extra for foreign purchases. The merchant might not give you all the details. Don't expect full disclosure of fees if you agree to dynamic currency conversion. Stores in tourist areas of major European cities are busy and crowded, and sometimes a cashier just won't think to give you all the information you need. And then, of course, there's the more sinister possibility: They know that it is a bad deal and don't want you to know what fees will be added on to the charge. If someone asks you if you want your credit card transaction to be done in dollars instead of the local currency, the solution is simple: Just say no. There will be times when a store owner won't take no for an answer, however. Thankfully, this doesn't happen often, but if it does, you have a couple options. You could either offer to pay cash for the items, or you could simply walk away. There's a good chance that the merchant will give in if he thinks that pushing currency conversion will cost him a sale. If he doesn't give in, however, just keep walking. Chances are that you'll be able to find that bottle of wine and cheese at some other store that will be a bit more welcoming. Finally, when your trip is over, be sure to go over your credit card statements with a fine-toothed comb. Keep your eyes open for any charges that seem unusual for any reason, and don't hesitate to call and ask the bank about anything that looks amiss. After all, the last thing you want is for some unscrupulous storekeeper to take advantage of you and tarnish your treasured memories of a magical, once-in-a-lifetime trip. Matt Schulz is the senior industry analyst at CreditCards.com, a site dedicated to helping people make smart decisions about obtaining and using credit. You can follow him on Twitter at @matthewschulz.